We were approached to provide the sound, lighting and entertainment for an exclusive wedding at The Grand Hall Bedford late 2017. The client had exacting requirements on the lighting and visual impact of the venue. The majority of the event would be taking place in the dull mid winter light and early sunset. We opted for static deep blues on our pixel battens to light the Victorian ceiling with areas highlighted with our HEX LED fixtures to add detail. Tables where spotted with a selection of white and filtered blue Par36. We were then able to keep overall light levels in the room down, whilst still providing adequate levels for the wedding breakfast. JHA Sharpie beams where used to bolster light levels as the evening went on and provided a dynamic light show for the evening entertainment. Audio for the entire day was taken care of by a full Void Acoustics Air Motion system. Guests commented on the exceptional sound quality in the vast open space. All this whilst fitting in the décor of the venue. Microphones for speeches and announcements were provided as well as background music through the day. 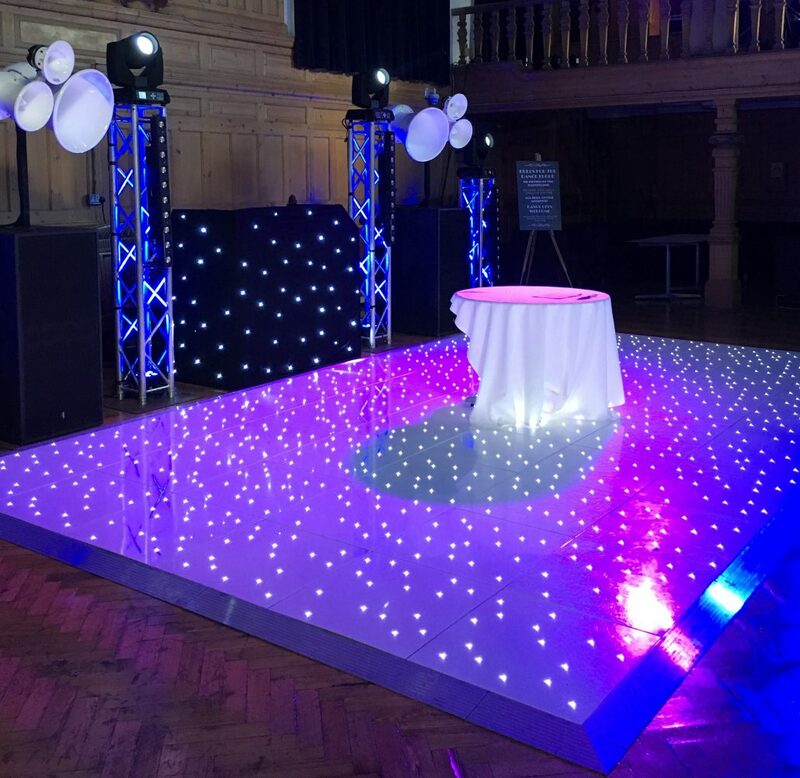 Finally a starlit LED dancefloor was added behind the top table with the wedding cake centre stage as a focal point before the dancing. The flagship of Powersoft’s technologies, ranking in the “Top Class” amplification of the global pro audio market. Offering various power ratings in 6 models ranging from 2 x 2400 W/ch @ 4 Ω to 2 x 9000 W/ch @ 2 Ω, still maintaining the 1 unit size, the K series represents a new milestone of switch mode amplification providing incredible power with the lowest weight and highest efficiency. The two channel Bias V9 DSP amplifier provides reliable premier-grade power and headroom in the smallest possible package size. 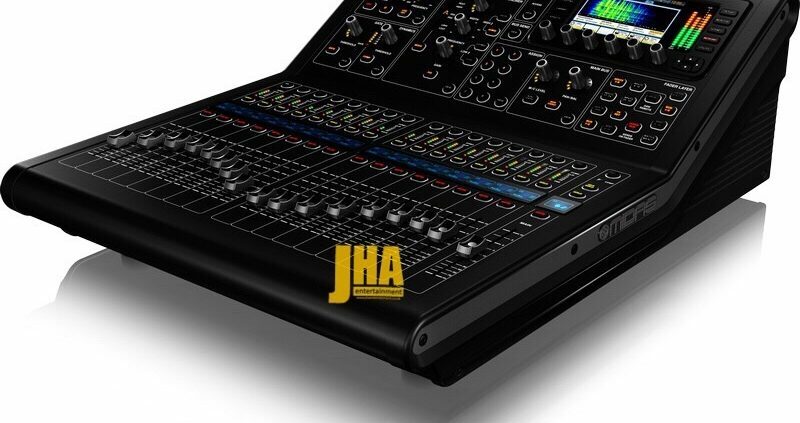 Fully digitally controlled and with a Rj45 PC communication port as standard, the Bias V9 amounts to a fully integrated, highly sophisticated yet easy to use power source including state-of-the-art sound shaping and system management capabilities. The Four channel Bias VQ DSP amplifier provides reliable premier-grade power and headroom in the smallest possible package size. 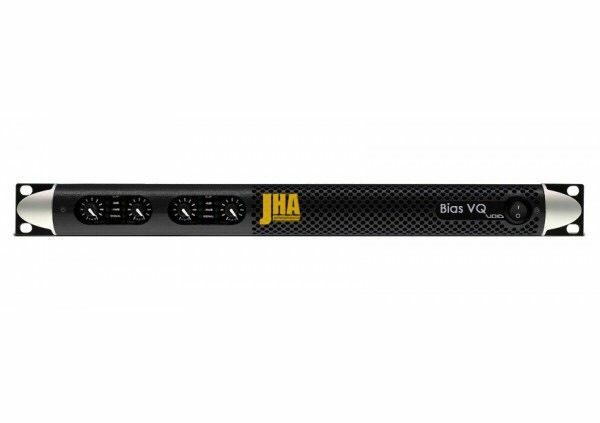 Fully digitally controlled and with a Rj45 PC communication port as standard, the Bias VQ amounts to a fully integrated, highly sophisticated yet easy to use power source including state-of-the-art sound shaping and system management capabilities. The CO2 Jet is a small compact device that packs a big punch. With blasts of massive white clouds of CO2 on festival stages and outdoor events. We carry a large range of safety equipment and Liquid Co2 distribution valves and hose. Large tour companies are using our custom live effects show control software for repeatable live shows. Our pure white starlit dance floors have been very popular with brides all over the UK. Adding that extra bit of breath taking elegance to your special day. Opting for our starlit floors means you can decide whether the lights can be set in either static or twinkle modes. Sparkling away whilst your guests watch your first dance. We can provide these amazing dance floors in a variety of sizes. Meaning we can transform any area into a magical breath taking dancefloor perfect for those all important First Dance photographs and for partying the night away. Each floor is delivered, polished and most of all left gleaming by our team of professionals. We ensure that they are always perfect for your special day. A close look at M32 reveals that the styling is completely new in every sense of the word. Rajesh Kutty’s automotive-inspired design elements mesh perfectly with a recognisable MIDAS signature, setting the M32 apart from any other console. Its beautifully streamlined and elegant form factor completely revolutionises the experience of live mixing. The MIDAS M32 construction is equally impressive, and is designed to offer you years of reliable performance while withstanding the demanding environment of live performance venues. M32 employs a predominantly space-frame construction, with parts of the sub-frame consisting of durable and lightweight carbon fibre and aluminium. Multiple alloys have been employed throughout to guarantee maximum component efficiency and an improved performance-to-weight ratio. The M32 is an innovative, evolved design that brings together modern construction principles and high-tech materials into a styling destined to go down as a landmark in console history. In 2013, MIDAS approached me to create a new design language for MIDAS and with it a new mixing console. Having designed for Bentley, I am intimately familiar with the challenge of transforming a brand while retaining the precious heritage – in this case the 40 year old iconic British mixing console brand MIDAS. Representing the pinnacle of its industry, MIDAS is the Epitome of Excellence. When it comes to ergonomics, performance and style, the aspects of a high-performance luxury carequally apply to a high-end mixing console. I was given a blank sheet of paper for my choice of materials. This meant considering lightweight materials such as carbon fibre and aluminum, while using a sophisticated steel construction, for high-impact structural areas. High attention was paid to the tactile elements such as fader knobs and the illumination to work under all background conditions. From the onset the idea was to break the mould! Hence the form study deliberately tried to break away from the static, bulky feel of today’s mixing consoles. Instead making it more dynamic, ergonomic, yet luxurious. Colours, size, mobility and hardware were given equal importance to arrive at the M32 – a true projection of the brand, today. I am very happy with the outcome of the M32, and feel honoured to have my name associated with MIDAS. The groundbreaking M32 console combines legendary MIDAS sound quality with advanced digital technology, future-proof 96 kHz capable open architecture design and industry-leading 192 kHz ADC and DAC converters, creating a revolutionary mid-format live console. M32 features ultra-sleek styling, offering you a truly luxurious mixing experience. High-end construction materials including carbon fibre provide unparalleled durability and strength, plus substantially lower weight than comparable consoles. The M32 utilises award-winning MIDAS PRO Series microphone preamplifiers and the custom-designed MIDAS PRO motorised faders that are rated for 1 million life cycles-three times more than other leading consoles. The MIDAS M32 is a future-forward console that completely raises the bar for live mixing. While the MIDAS M32 design, styling, and construction will surely turn a lot of heads, it’s the sound that matters most to engineers and performing artists. And that’s where M32 shines even brighter – as the latest in a long line of pristine-sounding MIDAS consoles, it descends from a celebrated lineage that literally set the standard in electrical design and sound quality. Ever since MIDAS consoles first found fame 40 years ago with acts like Billy Joel, Yes, The Beach Boys, Pink Floyd and others, the MIDAS legacy has always been about uncompromising quality and the ultimate in sound reproduction. Backing the analogue input section are audiophile Cirrus Logic multi-channel 192 kHz capable A/D converters, which boast a 114 dB dynamic range, ensuring impressively low distortion and low noise performance. The M32 is a console built for today, and tomorrow – its future-proof 96 kHz capable open architecture design and industry-leading 192 kHz 24 bit ADC and DAC converters provide outstanding state-of-the-art audio performance. The MIDAS mic preamp is considered by leading live sound and recording engineers to be the very essence of the famous MIDAS sound. More than 40 years of design experience paired with the fi nest choice of premium-grade components lead to the acclaimed warmth and depth, bring out subtle ambience, maintain spatial positioning, and more effectively capture a precise image. The acclaimed sound of the award-winning MIDAS microphone preamplifier has inspired generations of live sound engineers to their best work, creating sonic landscapes that have captivated audiences worldwide. The MIDAS preamplifier design eliminates typical imbalances of gain-setting stages, thereby improving the common-mode rejection ratio (CMRR) and harmonic distortion to an almost immeasurable level. The constant high-frequency bandwidth topology assures excellent stability, RF rejection and noise performance at all gain levels, contributing to its transparent, open and dynamic sound. But it doesn’t end there, over the years many mix engineers have found that this robust and overload-tolerant design takes on a whole new dimension of sound when driven hard, the pristine audiophile reproduction giving way to just the right combination of harmonics, a warm and organic sound heard by millions of concertgoers and recorded for posterity on countless live albums over the years. Since pristine sound always begins with the microphone preamplifier, the first point where your signal enters the console, M32 features genuine MIDAS microphone preamplifiers which faithfully reproduce every sonic detail so no part of a performance will ever be missed. Transparent and pristine sound, low noise and high common-mode rejection are all hallmarks of this classic design. The microphone preamplifiers are the very same ones used in the industry standard MIDAS XL4 and HERITAGE 3000 consoles, which many consider to be the greatest analogue live consoles ever built. Over the past decade, the XL4 and HERITAGE 3000 have been utilised by countless top artists including Bon Jovi, Alanis Morrisette, AC/DC, Coldplay, Kid Rock, Metallica, Alicia Keys, Foo Fighters, Christina Aguilera, Sir Paul McCartney, Pearl Jam, and many more. The M32 draws from this same legacy to bring you an elite professional level of audio quality and performance. Whether you come from an analogue mixing background, or are accustomed to using other digital consoles, your first experience with M32 has been engineered to be intuitive, fluid and straightforward. The brilliance of the M32 is its simplicity and workflow. Tactile controls allow smooth adjustments to critical elements as the mix progresses while the TFT screen keeps you informed every step of the way. This integration of tactile controls, motorised faders and the array of LCD and TFT displays makes the M32 experience the premiere solution for Live Sound, Broadcast, Studio Recording and Post Production applications. M32 changes the game by completely rethinking what is possible in a digital mixer. An intuitive workflow coupled with a fully interactive user interface ensures immediate familiarity and instills confidence. Advanced engineering and meticulous design deliver stellar sonic performance at an extremely affordable price – changing the game entirely. 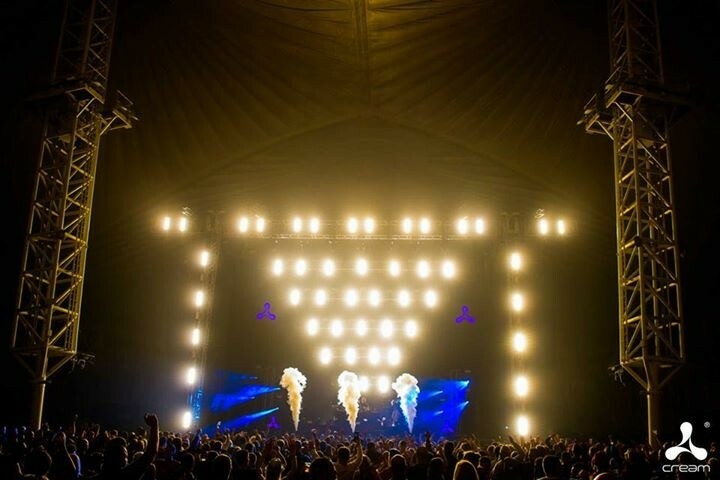 MIDAS’ experience spans over 40 years at the very top end of the live audio industry on countless world tours by the greatest artists and the most prestigious events. 40 years of relentless research, development with 300 of the world’s best engineers plus complete control over the manufacturing process. This is what powers the M32. Above all, M32 is designed to put the power of digital in your hands, without compromise. MIDAS’ singular focus on a matchless value proposition means M32 integrates advanced features such as motorised faders, LCD scribble strips, integrated personal monitor mixing and true high-speed digital audio networking as standard features. M32 is your “mind-to-sound” interface – the intersection of creativity and production. Whether you’re accustomed to digital mixers or not, the M32’s intuitive user interface offers a fluid mixing experience that instantly feels like home. From the first moments of use, the workflow unfolds in a way that strips away obstacles, distractions, and hesitation. The M32 Channel Strip puts the most important channel processing parameters into one section so that no matter which channel you are working on, the controls are always the same. This highly-efficient layout stems from MIDAS decades of console design and input from our users. Optimized control illumination ensures a clear indication of levels or status from any viewing angle. Illuminated rotary encoders and switches give you control of preamp settings, frequency shelving, dual dynamics sections, as well as multi-mode fully parametric EQ, bus sends, main, mono and stereo panning. M32’s 7″ day-viewable color TFT (Thin-Film Transistor) display shows the setting parameters you need when you need them. Selected for its high-contrast performance and outdoor visibility, TFT is ideal for concert and open air festival venues. Flanked by high-precision, context-sensitive tactile encoders, the screen comes to life and immediately reports in high definition all adjustments applied to a wide range of parameters. Intelligent design puts control of vital functions such as Effects, Metering, Routing and much more 1 or 2 button presses away. M32 brings the convenience of digital mixing to your Aux and output bus mixes too, thanks to its integrated Sends on Fader feature. This incredible function allows you to build powerful, dedicated sub-mixes for monitor, secondary zone feeds, and much more – all without affecting the front of house mix or levels. The M32 allows you to send your choice of signals to any Aux or output bus and then dial in the perfect mix via the channel faders. The console remembers where you set the faders and instantly recalls them when you select a bus for quick adjustments. DCA (Digitally Controlled Amplifier) groups allow control over several signals at once without actually mixing them into a subgroup bus. M32’s 8 DCA groups let you control multiple signals via a single fader, such as the entire drum mix, the horn section, or the backup vocalists, etc. DCA control affects the FOH mix, while allowing the individual buses to remain unchanged. The result is a customizable workflow that provides maximum flexibility, but still allows individual buses and subgroups to serve the purpose they were intended for, such as zone sends, broadcast feeds, etc. While some digital consoles offer a few user-definable controls, M32’s Assign section sets a new standard by providing a total of 36 fully customizable controls on three separate layers. As with channels and buses, individual Scribble Strips are provided for immediate identification. Buttons can be defined to toggle parameters on/off , adjust timing of effects by tapping, or jump to specific screen views. Rotary encoders with LED collars can be assigned to specific channel parameters, or to additional parameters in the Dynamics section relevant to the current channel selection. Legendary 40-year old British company TURBOSOUND, famous for producing some of the world’s best speaker systems, have teamed up with MIDAS to seamlessly integrate mixer and speaker systems. We call it “Acoustic Integration”. The M32’s ULTRANET bus allows streaming up to 16 channels of pristine digital audio to an array of TURBOSOUND iQ speakers – all on a single CAT5 cable, along with control data to set sound presets remotely. Furthermore, the iQ Series features “True Physical Modeling” of some of the most popular speakers which can be easily remote controlled via the M32, allowing the sound engineer to apply different speaker models in real time from the comfort of the mixing desk. “Acoustic Integration” is the next live sound revolution. The M32 includes a 100-band Real Time Analyser (RTA) with full bar and spectrograph views on the M32-EDIT control application. This high-resolution RTA displays the audio energy distribution in 100 frequency bands over time – capturing a sonogram window of a full 10 seconds. You can switch between the large RTA view to display any available signal at full screen resolution, or the combined view, which displays the RTA view above each of the channel and bus EQ curves. This feature lets you see the results of your filtering choices in the audio spectrum directly. Additionally, the RTA can be displayed on top of the 31-band graphic EQs in the FX rack. Monitoring and controlling frequencies has never been easier! We’ve added 16 breathtaking FX “Plug-Ins” to the M32, giving you access to a total of 50+ effects that would otherwise cost tens of thousands of dollars in hardware. This new generation of high-end FX “Plug-Ins” is based on True Physical Modeling of classic audio hardware. We essentially “rebuilt” classic analogue gear in the digital domain and included models of legendary processors such as Urei’s 1176*, Teletronix LA-2A* and Fairchild 670* compressors as well as the legendary Pultec* EQP-1a and EQ5 equalisers etc. We also added a cutting-edge 5-band multiband compressor. Last but not least, the M32 can now run 4 studio-quality stereo reverbs together with 8 channels of 31-band graphic EQ. This allows you to replace your old outboard gear with a fully recallable onboard solution. A new Gain Split mode separates channel gain (trim) from the head amp gain, allowing both the FOH and/or the monitor engineer to adjust local trim digitally – and independently of the preamp gain. Additionally, the new HA Gain Remote option allows console gains to be remotely controlled by an external console, such as when using the M32 as a stage box. The M32’s routing becomes even more flexible with this recent firmware upgrade. Output signals and XLR outputs are now treated separately, allowing signals from AES50 sources or expansion cards to be routed directly to the M32’s analogue outputs. For example, now you can use the outputs from an M32 for directly routing back PA or monitoring signals from a main or FOH console. New output tap points can be set as pre- or post-mute for greater usability with your P16 personal monitoring mixers. This is very useful in situations where you don’t want mute groups to interrupt your signal flow. Introducing the Cue List, an innovative way to automate the loading of scenes and new “Snippets” at different points during a show. Each of the 500 Cue entries can load any of the 100 Scenes or Snippets separately or at the same time. This gives you an amazing total of 500 Cues x 100 Scenes x 100 Snippets! For example, store your favorite EQ settings for drums on channels 1 – 8 as a Snippet, recallable in an instant as its own preset, completely independent of the console’s overall scene. It’s like taking a snapshot of a parameter on an input, return, FX slot, bus, Matrix, Main or DCA group – and saving it for quick access whenever you need it. In our pursuit to lead the industry in every possible aspect, we decided to design the world’s most reliable motor fader. We dove deep into materials science, employing semi-precious metals that offered the durability we desired. We took painstaking care to design a motorised fader that would provide continuous performance night after night, year after year. After spending a great deal of time working with metal vendors, we developed precision components that off er high linearity, robustness, and smooth feel during operation. We needed ultra-straight high-grade steel guide rods with smooth polished surfaces – and we got them. We worked closely with our manufacturing partners to maintain the tolerance of our parts, always choosing the most suitable materials and controlling the processes to ensure consistent moulding quality and eliminating the warping and deformation caused by shrinking as the parts cool. True, none of this was easy – we spent many long hours developing the MIDAS PRO FADER design. However the results speak for themselves. MIDAS PRO FADERS are rated for up to 1,000,000 cycles – three times that of other leading manufacturers. A total of 29 programmable LCD Scribble Strips offer channel/bus identification that mirrors what is being controlled. Use them to enter input/output tags, plus add icons you recognize at-a-glance. Then assign colors to create visual groups for immediate, on-the-fly recognition of similar inputs.